I am reverse engineering a game that has been dead for a while and am currently working on figuring out how their packet encryption works. 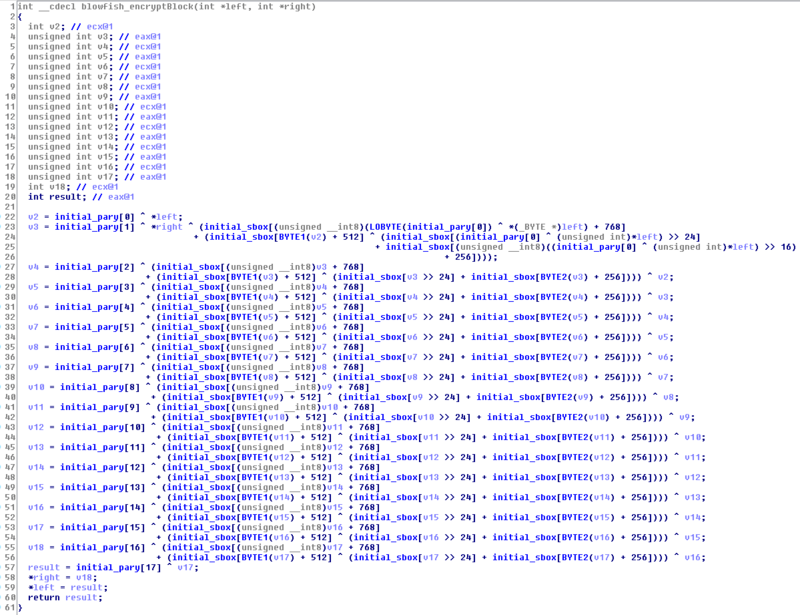 Almost have it complete but I am having trouble understanding a piece of (decompiled) code. I'll explain the flow of the program so you have an idea of what is going on. Memory space at packet payload location before encryption. 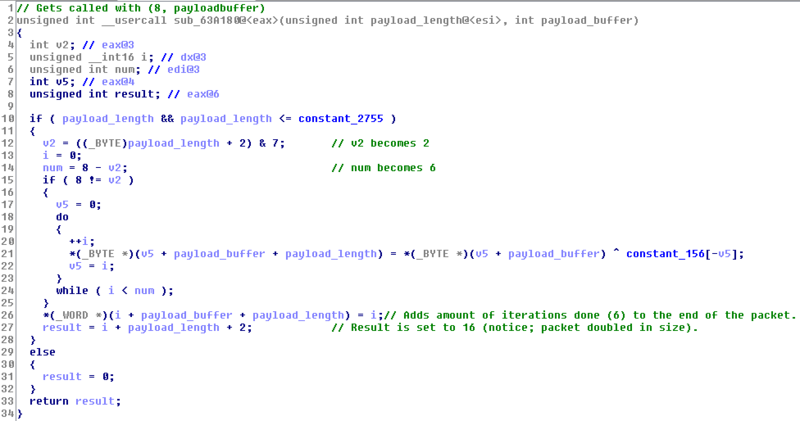 I suspect that "08 00" is payload length, "01 00" is packet id, "20 FB 19 00" is unknown and "70 00 00 00 6C D4 19 00" is not actually part of the payload here. constant_2755 is set to "2755" after the blowfish key has been initialized. constant_156 is set to 0x9C (156) in the binary and never changes, not sure why IDA thinks it is an array. See data here (https://i.imgur.com/3Qe2cJM.png). Memory space after subroutine has been executed. The packet gets an header (https://i.imgur.com/mkotNk6.png) with an unknown "03" byte. This is the packet I end up receiving. "14 00" is the packet length (20). "0E" is the last byte of the checksum (927D3B0E) of the payload. 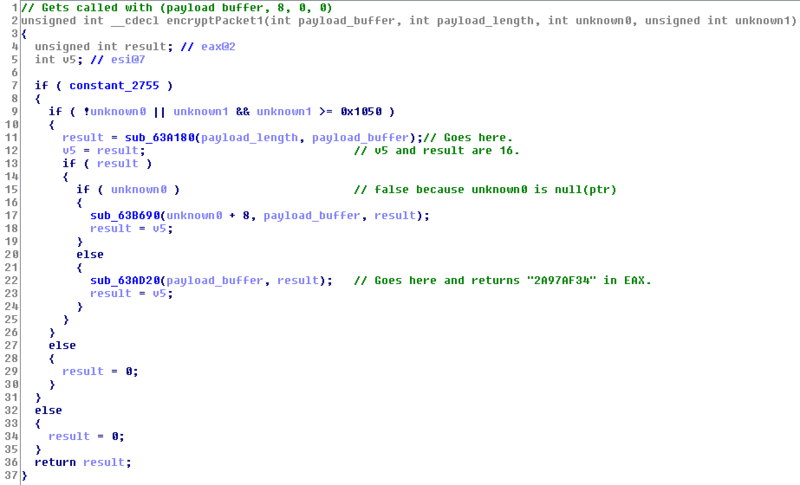 "C3 86 06 B6 80 03 0E 05 34 AF 97 2A 83 6F 72 CF" is the payload. The blowfish key is "66642423323E34357D5F7E2E33384C6160272B52452F252D49613D7C3958283F00" in hex, this has been verified by checking initial pary by stepping after set key in a debugger and compare it with a c# blowfish implementation using the key. It is 33 characters in size. I have no idea what is happening in step "Step 2.1" and why. Tried looking at various blowfish implementations but none of them seem to do that. Also my c# code fails to reproduce anything of "Step 2.2". Used the c# file listed here https://defuse.ca/blowfish.htm. Output is always "F2 D1 B4 8B 36 F4 C8 93" instead of "C3 86 06 B6 80 03 0E 05". Same goes for decryption, I can't decrypt the last 16 bytes of the packet (using the same blowfish lib). The reason is that blowfish is usually interpreted with two different endianess. bf_ecb in openssl gives the result you have there while other blowfish implementations (like "encryption blowfish" in quickbms) do the opposite, in fact if you use bf_ecb in the above script you have your same result. Thank you! Could you tell me in what part of the algorithm the endianess is so important? If I have to guess it is where it converts the left and right from 8 bytes to 2 unsigned ints, right? I'll give various c# blowfish implementations a try but if none of them work I'll probably modify one. Edit: Fixed it by using https://github.com/Mikeprod/Blowfish-compat in compat mode, thanks!